In a fairly lengthy interview with ESPN’s John Clayton yesterday, Raiders owner Mark Davis held court on his team’s stadium issues. While much of it was a rehash for those who have been following this saga intensely, it was good for casual fans and observers to get even the tiniest bit clarity. In any case, the Raiders saw fit to republish it on their own website so it must have the boss’s approval. What caught my attention was a change in how he saw the Coliseum being developed. While continuing to call for the Coliseum’s demolition, Davis dreamed out loud of a dual-stadium concept in the old venue’s place (emphasis mine). One of the challenges we have with that is that we share the stadium with the Oakland A’s. The Oakland A’s have a 10-year lease to remain in the Coliseum. One of the plans that they’re talking about is, is us building the stadium in the corner of a parking lot and then once our new stadium is built, then they would rip down the stadium and build the new one for the A’s and build housing and all of that stuff. That just isn’t a situation that I want to get us into. I would like for, if possible, the Raiders and the A’s to stay on that site and that the Raiders and A’s vacate the Coliseum for the next two or three years. We build a brand new football stadium and a brand new baseball stadium on the site and then we’d come back and begin playing in two brand new stadiums without construction going on around us, in brand new stadiums. The desire to avoid construction zone headaches remains steady for Davis. Plus in this concept Davis would preserve surface parking, a goal shared by A’s owner Lew Wolff. Wolff doesn’t think the place can properly support more than one stadium project, so how could something like this be done? It’s nothing like Coliseum City, which has planned phases. Both stadia would be done simultaneously, like Arrowhead Stadium and Kauffman Stadium in Kansas City. Let’s imagine a timeline for Davis, assuming no legal, logistical, or financial obstacles (follow me on this). End of 2015 – Coliseum City is scrapped. Raiders play their last game at the Coliseum in December. Raiders and A’s hammer out stadium development deals with Oakland/Alameda County. Partial demolition begins (ironically) with the newest part of the Coliseum, Mt. Davis, returning the venue to its 1995-96 state – but with the Oakland Hills back in full view. That occurs from November 2015 to March 2016. 2016 – A’s play their last season in the old Coliseum in reduced facility. A’s lease is revised (with no penalty to anyone) to reflect this. Raiders and A’s finalize their financing plans for their respective venues. November 2016 – Demolition of rest of the Coliseum begins, which should take 6 months to complete including grading for new venues (use drawn out Candlestick Park demolition for reference). April 2017 – Construction starts on both stadia, with a planned completion of Spring 2019 for the A’s, Summer/Fall 2019 for the Raiders. Both teams use smaller footprint, simpler plans and Levi’s Stadium-style incentive/penalty system to execute those accelerated schedules (24 months for A’s, 28 months for Raiders). 2018-2019 – Warriors vacate Oracle/Coliseum Arena for San Francisco. Decision is made on whether to keep arena or demolish it to make way for other development. The Raiders would have to play at a temporary facility for three seasons, the A’s for two. AT&T Park would have to be a considered a frontrunner for both, oddly enough. Memorial Stadium remains off limits to the Raiders thanks to a legal agreement between UC and the City of Berkeley, and Stanford Stadium is a nonstarter for both the university and City of Palo Alto. Davis doesn’t want to play at Levi’s Stadium for his stated reasons, though it must also have something to do with the 49ers’ desire to have a tenant for at least a decade in order to pay for the second home team locker room. Final total, not including the planned work on the Coliseum transit hub, is $1.665 Billion. Obviously, much of that would be covered by the teams, the NFL, and perhaps third parties, but the gap for the Raiders remains, and the need to retire the legacy debt from project sources without hitting either Oakland’s or Alameda County’s general funds means that the public sector would have to give up something. For now it’s unclear what that is since the Coliseum’s land is not going to be that public contribution. Price tag aside it’s a tantalizing vision for fans, and one that runs counter to planning and growth goals for Oakland and Alameda County. From a broad perspective, the public sector wants housing of different kinds and price ranges to ease the current crunch. Pols may see this as nothing more than doubling down on the stadium deals of 20 years ago, which brought only fiscal pain and little real security with regards to the teams staying in Oakland. The people who might like it the most are workers at the Coliseum complex and businesses west of the Nimitz who thought their livelihoods were being threatened by Oakland’s sweeping zoning change proposals. As for East Oakland residents, well, how much has this hulking pro sports complex improved their lives in nearly 50 years? This entry was posted in Baseball, Coliseum, Football, News, Oakland, Owners. Bookmark the permalink. Does the baseball price include a cute small dome like the one we have in Houston? That one cost less than 600K and the land was not included. Of course here in TX we pay slave wages! Afraid not. In the nearly 20 years since Minute Maid/Enron broke ground the cost to construct is 2-3x. After all this time, we are still coming back to this delusional two stadium concept with all the problems it creates still unresolved. ugh!. Can’t they design a park like the Metrodome that converts? No one wants that. That’s how Oakland got into this predicament in the first place. OK! I know I am naive….. Think you nailed it, GoA’s. Doors are closing for Davis. Carson not happening, Kroenke not needing him, Oakland not ponying up money. He’s going to be left with San Antonio (in an old stadium), maybe Saint Louis or Levi’s. Could not have said it better myself llpec. This idea makes Coliseum city look realistic…WOW! 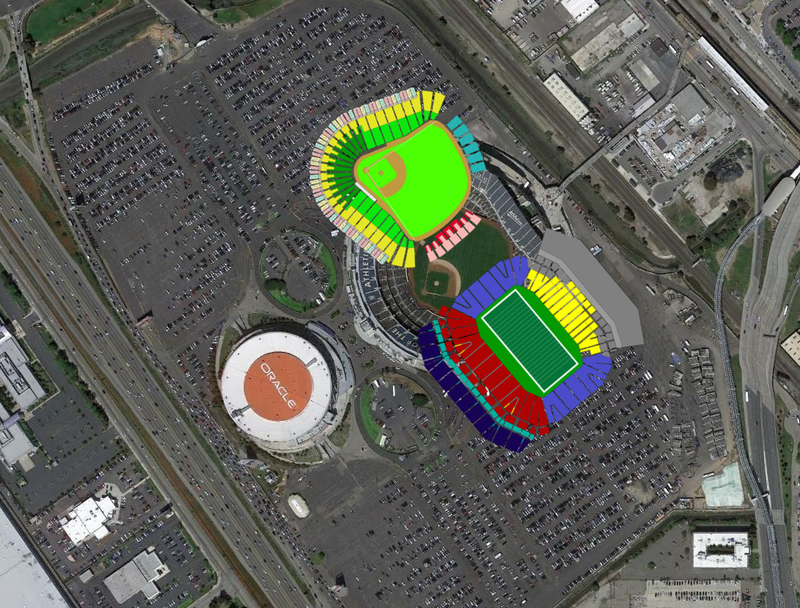 “Dream” for the Raiders to leave so that Wolff could present some brilliant ballpark plan at the Coli? That’s one heck of a dream my friend! $400 million funding gap for a new Raiders stadium… $600 million funding gap for a new A’s ballpark at the Coli. Got corporate support or massive public financing anyone? OT: Damn Stephen Curry better be at one of the A’s games this weekend; can’t just show the Fucken Giants some love!! I don’t think there is any way the A’s would have their new $600 million ballpark oriented to face “Raiders Stadium,” especially after having had to deal with a view of Mount Davis for the last 20 years. Isn’t it all about where the sun sets? They can rotate it 90 degrees. Not a big deal. The same old money problems remain with this “plan” – $1.5 billion worth of new stadiums in a place where there is no public money, insufficient corporate money and PSLs already have failed. I thought we covered all this about 7 years ago? Got spend money to make money in the long run. That is just the way it is. i can’t believe if the a’s park is built at the current site that no type of development won’t be build nearby. okay maybe it won’t be as “grand” as what coliseum city was going to be but when you have the chance to create a few restaurants and or bars across from the venue where you could see as many as 20k-30k fans there 81+ times a year, it all but make sense. do other newer park built in the last decade in open space like citizens bank park in philly, miller park in milwaukee, rangers stadium, city field in nyc and probably forgetting one or two others have anything built around them so fans could go there before and after games? In Philadelphia they have a little development in the parking lot. It’s got a bar and it’s sort of like an upscale food court. I think it’s called Xfinity Center or something like that. My brother and I hung out in there before the game and it was pretty okay. Not awesome, but not horrible. It could be a lot better if they didn’t need so much parking (it’s basically the current coliseum complex with three stadia instead of two with an arena, football stadium and ballpark all sharing the same general area). Arlington is really a different bird than Oakland in so many ways. Though, oddly enough there is a WalMart adjacent (just like the coliseum). There are also hotels and the like around the area because there is a massive theme park just down the street. There isn’t really any development directly adjacent to the ballpark that I recall, but there is a lot of stuff in the area but not really walkable. CitiField has some stuff nearby, beyond the center field side of the stadium. I didn’t go to any of it, because the subway drops you off on the other side of the stadium and I just wanted to get in and eat some shake shack. I will probably be back there in summer and I plan on getting there earlier and checking the area around the park out a bit more. I’ve never been to Miller Park. Philly model of having the stadium, ballpark and arena in the same lot of land is what should be used here in Oakland. The great thing about this Coli Site is of course the great public transportation hub centered right smack in the middle. As Jeffrey said, most of those parks are pretty limited in their offsite offerings. In addition to the ones he mentioned, there was basically nothing around Miller Park (at least when I went, which was a few years ago). Of course, even a small entertainment center like the one in Philly would be a big improvement over what we currently have for offsite entertainment at the Coli, which is nada. I like the idea of Mt. Davis being brought down first allowing the A’s to play one more season in the pre Mt. Davis configuration as it was before the Raiders came back. That would be quite cool….Part of me is hoping though that they can get the 2017 season in also for an even 50 Seasons. I figured we would hit that mark, but who knows. It depends on the Raiders saga of course. 1) Showing the NFL that he has exhausted all of his best efforts in Oakland, was flexible in his dealings with the A’s… we tried, our hands are tied… we have to move. 2) Trying not to lose the Bay Area’s fans… hoping they will follow the team to LA. Hoping fans who are also A’s fans won’t bail on the Raiders because the Raiders bailed on the A’s. Same thing… we tried… our hands are tied… sorry but there was nothing we could do but move. Also, don’t be so quick to say LA is out of the picture if the Chargers stay in SD. My bet is the NFL would rather have the Rams and Raiders share an LA stadium anyways. That way there are no “division rivals” sharing issues, need for realignment, etc. Nobody is being so quick about anything. Carson won’t happen if SD stays and than Mark will have to work to partner with Kroenke. Kroenke may not want to share but NFL will mandate it most likely. Mark doesn’t want to be team #2 though or a tenant. If the only way Mark Davis can bring his Raiders to LA is to become a tenant of Kroenke, then the Raiders might as well stay in the Bay Area, with their loyal fan base, and share Levi’s Stadium with the 49ers. That’s, of course, if Davis is unable to get an acceptable Coliseum site stadium deal done. Kroenke will share if the NFL says he must if he wants to move. This is the sharing situation that makes the most sense. Who knows, Kroenke might also be convinced to let Goldman Sachs take all the risk, sit on his Inglewood property or do some other development there, join the Carson deal and keep most of his money. Carmen Policy is on the record stating Goldman Sachs can finance Carson with the Raiders being the only tenant. Let’s also not forget that Davis would be a tenant in a shared Carson stadium. The difference would be that he would be paying rent to a stadium authority and not another NFL owner. There has been a study released that the only way Carson makes money is with two teams. Not one. Personally, I think that location in Carson is going to be a traffic nightmare with only the jam packed 405 and zero public transportation. Los Angeles DEFINES “traffic nightmare”, so what’s new there? If you live there, you accept it as part of every day life. The city of Oakland will not OK any stadium deal that does not eat the debt and purchase the land for new venue construction at market value. Not to mention no public money will go into a new raiders stadium but Oakland wants to increase economic vitality in east Oakland with hotels and unaffordable housing that will ruin the surface parking that Lew Wolffe and Mark Davis will not give up. To many conflicting desires with no compromise in site after years of public money wasted on coliseum city specific plan and eir. Raider will have no choice but to settle for a remodel of the coliseum again and Athletics will finally build a new ballpark at the coliseum after the dubs move to sf and oracle get demolished. You were doing GREAT up until the point you stated the A’s would build new ballpark at the Coliseum. Everything you mentioned prior (which again was excellent) is what will prevent the A’s from EVER building at the Coli. Overall nice comment though. Thanks Tony D. In the end nobody will get what they want. But hopefully the A’s will be the last man standing. They are in the best position out of everybody with that could be a 10 year lease. Don’t need multiple hotels on the site…just one good one and don’t need to have so much housing on the site. Open space parking is needed however regardless. Oakland officials (or the Niners possibly) might be fortunate, the Raiders might be stuck in Oakland or Santa Clara. The San Diego city effort to keep the Chargers looks good. Since the NFL would prefer to prevent franchises from relocating – it would be difficult for the NFL to refuse the San Diego city officials efforts. Also the Chargers may prefer to stay there anyhow, and have being bluffing with the Carson project all along. Even though the Inglewood plan includes a 2nd home team locker room, and Kroenke reportedly would be willing to rent to a 2nd team, (Kroenke wants total control of the franchise – including owning the stadium) Davis does not want to lease, so Inglewood would be ruled out for the Raiders. Everyone is assuming the Rams are going to Inglewood because of the money Kroenke can make off the land deal. He can certainly make a lot of money there, but it’s not clear to me that the NFL stadium is an essential component of the development (or even a net positive). I could see a scenario where, if St. Louis ponies up for a new stadium, the Rams stay there and the Inglewood project goes forward without a stadium. Kroenke would save $1.8 billion in construction costs and free up a lot of land for other development. Very much a “have his cake and eat it, too” scenario. has there ever been a reason why both owners have said they’d rather have parking rather than development? especially wolff considering he is a developer by trade. maybe the reason or reasons have been stated before but don’t remember them? has there ever been a reason why both owners have said they’ve rather have parking rather than development around the new venue? especially wolff considering he’s a developer by trade? McKibban says City and County have a backup plan if Kepharts financial plan fall through to try and keep Raiders. there are 18 events scheduled at Levi’s stadium over the next 6 months. 10 are football games.